The Crew's new main video display will be expanded to 17 feet by 66 feet, more than double the board's current display. When Columbus Crew fans enter Crew Stadium March 22 for the club’s home opener against the Philadelphia Union, they will be greeted by a much different stadium experience than what they’ve become accustomed to. The club announced Friday that manufacturing has begun for new "state-of-the-art" video boards, highlighted by a new main scoreboard on the south side of the stadium. New ribbon displays on the east and west sides of the stadium and an auxiliary video board on the scoreboard will be added as well. 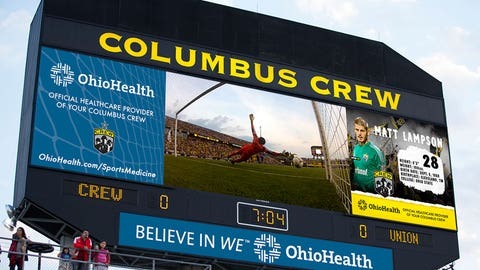 "We have been going through a thorough process of analyzing all of the different aspects of our club and where we need to make improvements, and it was fairly obvious that replacing the existing video board at the stadium was a top priority of Precourt Sports Ventures for improving the fan experience," Crew Chairman and Investor-Operator Anthony Precourt said in the team’s release. The main video display will be expanded to 17 feet by 66 feet, more than double the board’s current display. The club says the new screen will be capable of live highlights, instant replay, animations, statistics and advertisements. A miniature display will sit underneath, and both will be in full "Daktronics 15 HD technology." Over the offseason, the Crew have also invested in new "Premier East" seating in sections 105-107 on the east side of the stadium, where there will now be individual chair-back seating similar to what already existed on the west side. The club will also be adding four more access points to the lower level concourse concession stands and restrooms to alleviate congestion and foot traffic in the stadium during matches. Crew President Mark McCullers said that the move should give fans confidence in what Precourt plans to do with the club, and the commitment the team still has to Columbus. "These are significant upgrades for our fans and sponsors," McCullers said in the team’s release. "The new seats and concourse access points on the east side of the stadium are major improvements for the fan experience, and the new video board capabilities will allow us to create deeper fan engagement and feature our partners in a technologically advanced platform that provides greater value. I think these investments speak volumes about the commitment that Anthony is making to this community and Crew fans to ensure we provide the right type of experience to help grow our season ticket base and our corporate partnerships." John Clem, President of the Crew Supporters Union, said that he already had plenty of confidence in Precourt as an owner, but that the upgrades were still a very positive step. "It reaffirms my confidence that Precourt has the best intentions for make Columbus a big player in the league for years to come," Clem said. All planned improvements are expected to be finished by the team’s home opener, and though a dollar amount was not released, the club called the changes a "multi-million dollar" renovation.